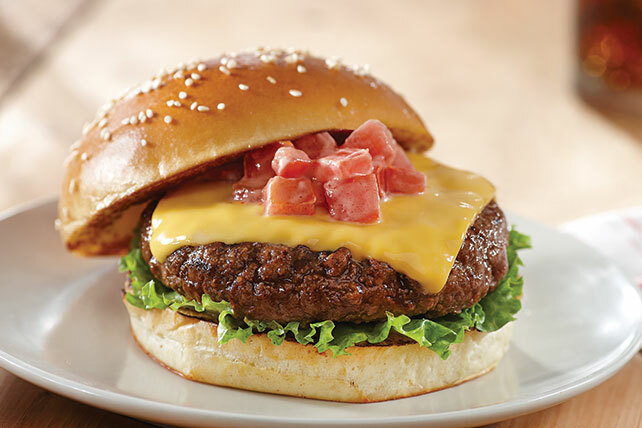 Cook your very own steakhouse burger right at home! These Steakhouse Burgers with Cheese are a great restaurant-style option when you don't have the time to go out to eat. In fact, your family might even ask to stay in a little more often. Combine tomatoes, dressing and 1/2 tsp. steak sauce. Mix meat, onions and remaining steak sauce; shape into 4 (1/2-inch-thick) oval patties. Grill patties 4 to 5 min. on each side or until done (160�F); top with 2% Milk Singles. Add bread, cut-sides down, to grill. Grill 1 min. or until Singles are melted and bread is lightly toasted. Fill bread with cheeseburgers; top with tomato mixture.